On opposite sides of an outraged world last week, aviation investigators painstakingly worked to reconstruct the causes of two explosions. 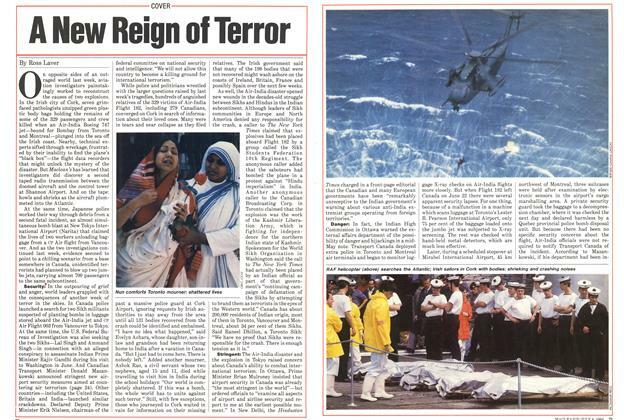 In the Irish city of Cork, seven grim-faced pathologists unzipped green plastic body bags holding the remains of some of the 329 passengers and crew killed when an Air-India Boeing 747 jet—bound for Bombay from Toronto and Montreal—plunged into the sea off the Irish coast. 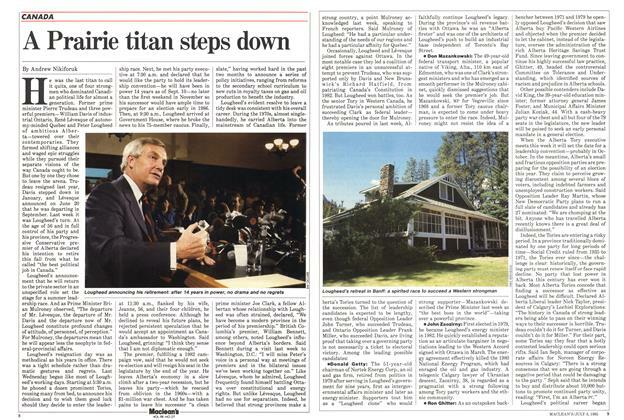 He was the last titan to call it quits, one of four strongmen who dominated Canadian political life for almost a generation. Former prime minister Pierre Trudeau and three powerful premiers—William Davis of industrial Ontario, René Lévesque of autonomy-minded Quebec and Peter Lougheed of ambitious Alberta—towered over their contemporaries. As the summer sun dipped slowly into the Mediterranean, they gathered in a dusty schoolyard in West Beirut. 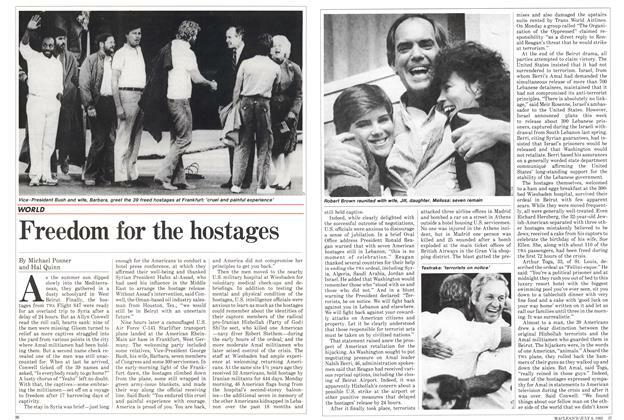 Finally, the hostages from TWA Flight 847 were ready for an overland trip to Syria after a delay of 24 hours. But as Allyn Conwell read the roll call, hearts sank: nine of the men were missing. Canada's first venture into maritime defence was inauspicious. Warned in the closing months of the 1870s that hostility between Imperial Russia and Victorian Britain could disrupt the transatlantic grain and lumber trades, Prime Minister Sir John A. Macdonald asked London for a fleet to protect the Atlantic coast. It is the children the world will remember. Clutching teddy bears and Cabbage Patch dolls, report cards and other talismans of achievement in their parents’ new land, the 80 young passengers who died long before their time were aboard Air-India’s Flight 182 because it flew directly to Bombay and was the first to leave after school was out. It was pure chance that led police in Calaveras County, Calif., into one of the most gruesome cases of multiple murder in American history earlier this month. They detained Leonard Lake, 39, in connection with a shoplifting incident, but when the ex-marine and self-styled survivalist committed suicide by swallowing cyanide in their custody, the police began investigating his wilderness ranch in the foothills of the Sierra Mountains. The agenda was short but pressing. In a boardroom on the fourth floor of its headquarters on Montreal’s Sherbrooke Street, members of the International Civil Aviation Organization (ICAO) sat down last week at an emergency meeting to review security standards at airports around the globe. The tragedy sent shock waves around the world, but nowhere was the grief more deeply felt than among Canadians of Indian heritage. 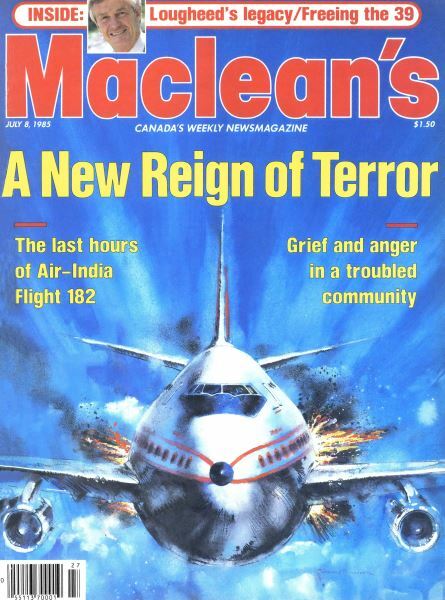 At least 279 of Air-India Flight 182’s 329 passengers and crew were Canadians, and many others were Indian citizens returning home after visits with relatives.